In this guide, we will go over how to complete the registration process and how to choose the first channel you would like to sell on. 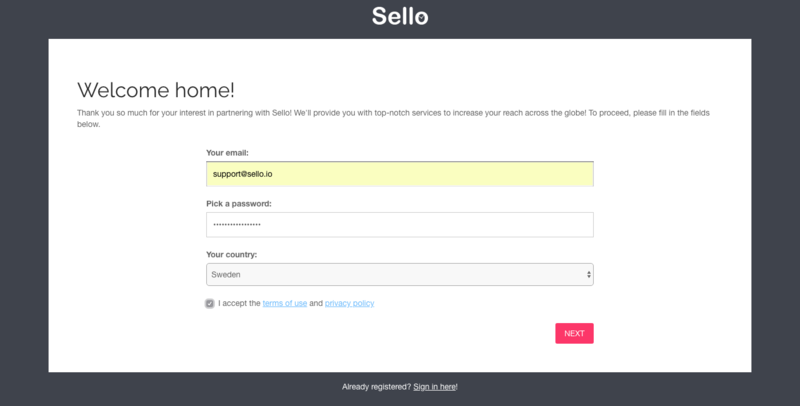 On Sello’s landing page (https://sello.io), press “Try for free now!” to start the registration process. This will create a so-called “test account” which is entirely free for 14 days. When those 14 days are up you will be asked to upgrade your account to “premium” in order to continue using our services. You can, of course, choose not to upgrade but this will limit your account to only our most basic features and you will only be able to sell on Tradera, which is free to use with this type of Sello account. Go to: https://sello.io and press “Try for free now!”. Input your email address and choose a password and country. 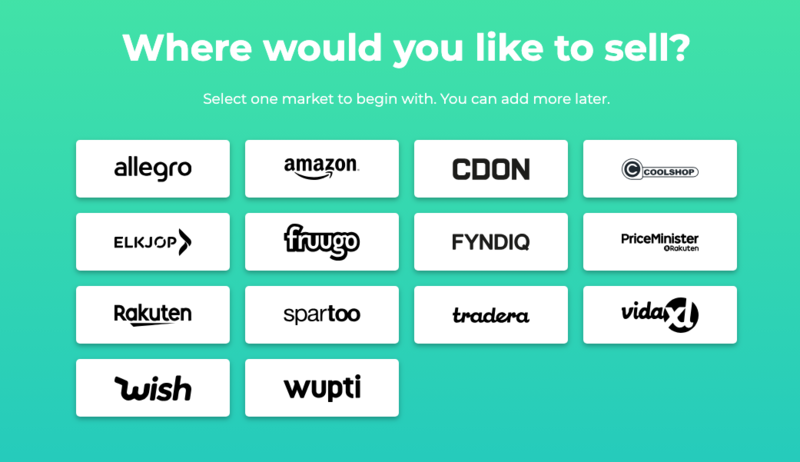 Choose one marketplace to start with, if you are approved as a seller there already, you can connect to it immediately. If you haven’t applied for a sellers account on the marketplace yet, click “Connect Later”. Input your webshop’s URL and click “Analyze Shop”. If you don’t have a webshop, click “I Don’t Have A Webshop”. If you clicked “Connect Later” after choosing your first marketplace we will create a temporary connection which you will need to complete when you are ready to start selling. 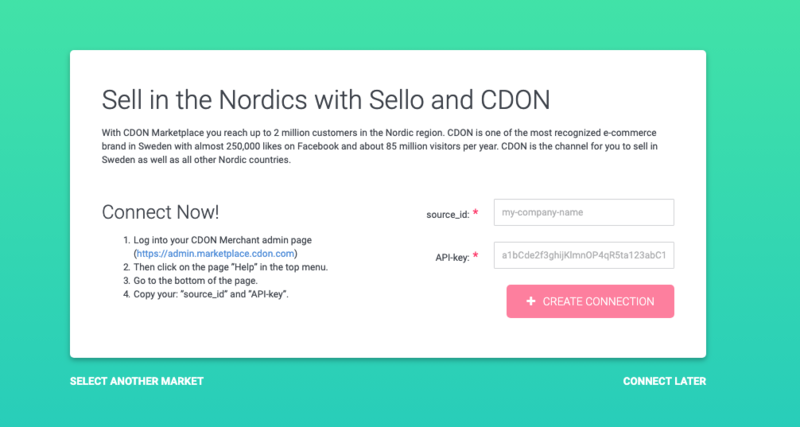 You will have to get an account on the marketplace you would like to sell on and input API-credentials in Sello before the connection can be activated. Read more about creating connections here. If you have a webshop there is a chance we can import your products and create these directly in Sello’s inventory. Whether we can import your products or not depends on what system your webshop is based on, click “Analyze Shop” to find out if an import is possible. 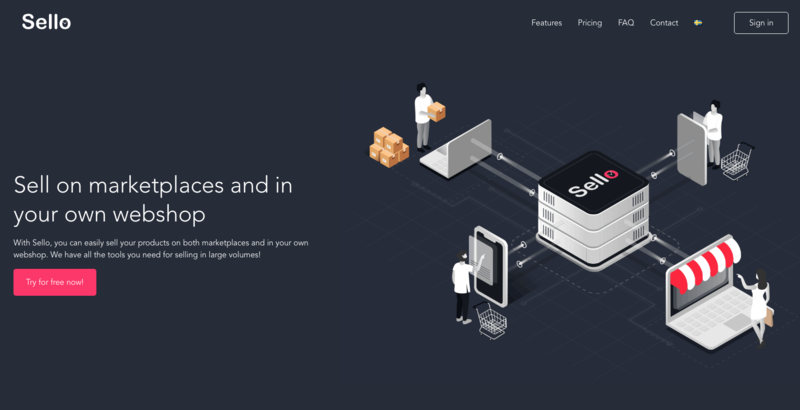 Take your time to prepare your products and connections during the trial period when Sello is free. Make use of the temporary connections to prepare your products and make sure everything is ready to start selling on those channels. Even though these connections aren’t fully operable you will still have access to the marketplace specific categories and requirements, which makes this a great time to familiarize yourself with what each marketplace requires when it comes to your products. Read more on how to work with Sello here. Login failed. Have you forgot your password? Fel kod angiven. Skicka ny kod. Don't you have a Sello account? Register here. Could not create the account because there is all ready an account created on the exact same e-mail address. By becoming a member you acknowledge that you have read and agree to the user terms. Do you all ready have an Sello account Login here.